"I fish! Fishing is my life! I fish for something every month of the year." A journal of my adventures. Hope all is well with you on this very typical Oregon Spring, (rainy) day! It was brought to my attention that the Discussion board holds tremendous potential for all of us, and yet seems to be fairly quiet. The Discussion board currently does hold some very valuable information. 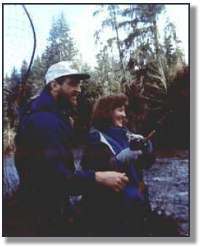 Recipes for egg cures, updates on Tillamook Bay by **** and information on sturgeon by Don Larson. Now, if we all get on there and post our updates, we will have a very VALUABLE resource! We have to all get in there though! The fish in Coffenbury are a little bit bigger, but still no vitamin fed trout. I will be off for a couple of days, and the next trip I will be taking for sure is with **, on Tuesday. Can't wait! Jennie may get a chance at a Springer yet!!! Anyway, have a great day, and I'll catch you up soon! WOOO HOOOOO! Fishing on T-Bay tomorrow! I can't wait, I know it is going to be miserable out there, cold, windy, but WHOOO cares? I need this.. I need to rip some lips! I want a sturgeon, a Spring Chinook, a flounder, a Loch Nes Monster! I don't care what it is, but I have to have something on the end of that line! I have so much work to do before I go so I don't do that guilty fishing trip thing. I want to have fun with a clear conscience and devote myself 1000 percent. I am guilty of staring at rod tips for hours in a fish trance. Just try and talk to me... "HELLO? JENNIE????" How can I possibly look at anyone, and carry on a conversation and take the chance of missing a small twitch? Iv been accused of standing at total attention. Kind of like trying to get the guards at the tomb of the unknown soldier to smile. I tried that.. I tried everything. winking, smiling... Not a chance. Those guys are serious.. So am I. Reminds me of when I played the piano for President Reagan, and I tried to get the security guard who was guarding my piano to smile. That didn't work either. How do you blame them? They are protecting the President! And I am protecting my catch! Same thing, right? This is SERIOUS! Thanks to all of you again, for posting on the discussion board. Lots of neat entries including a very nice one from Mark Larson about jetty fishing. It really inspires me to go out there again. Wow! I want to go! I just love this! Talk about an inspiring group of fish people!I learn so much! Sounds like the chances of catching a Springer tomorrow are not all that hot, but who knows? Guess we will mostly be trying for sturgeon, and although I prefer to fish for sturgeon in bikini weather, and for steelhead in this rainy cold stuff, who really cares? The water will be gorgeous to stare down into, and I love the full fury of a storm on the bay. Exciting! It won't be all that bad anyway, just squalls. , who lives his life out there on the bay, and other waters in this changeable Oregon weather. I have to go out to the garage and the basement, and wherever happens to lie a bucket of fishing stuff, and for the 99th time this year, separate things into different category tackle boxes, only to have them messed up again in a matter of weeks. argh. New line on my reel, I'm ready!! I had the most wonderful day, fishing with out on T-Bay yesterday! We had the best time! Lots of laughs, and lots of fish! In fact, I had sturgeon for dinner last night! Yum! First off, though, I didn't get any sleep at all! I was watching about the Tornadoes in Oklahoma, and it got me upset and wound up. I don't even know anyone in Oklahoma, but still, I was upset by the devastation, then add to that the "I'm going fishing in the morning" excitement that seems to wake me every two hours before I go on a real fishing trip, and that adds up to zero sleep! I was so excited! Anyway, got up at 4:30, got the kids ready for school, and drove to Garibaldi to meet up with Don Larson and . I had never actually met either one, but we had e mailed and talked on the phone. What nice guys! Both of them! They had me laughing in minutes, and I don't think I stopped smiling once! It's a guides job to be personable, but this guy is downright entertaining, and catches fish! We got to the location 3 hours before low, and fished with jumbo sandshrimp. Soon we were blasted with hail and rain and wind, but our spirits were not dampened. In fact, we caught the first legal within the first hour! The bite really picked up, however, on the incoming, and we must of caught 6 or 7 sturgeon, with two legals, that we kept. We almost had three, but the last one was so close to 42, but maybe, not quite, ( I still wonder...) that we threw him back. OUCH that was hard to watch! Bye bye fishy! They are such FAT fish in T bay! I felt like a spoiled fishing girl! casted for me, baited for me, I thought he might even scratch my back for me if I asked! (O.K., I didn't push it or I may have gone overboard, literally...) What luxury! Although I usually prefer to do all this myself, well... in this case it was nice... I was tired, and unsure of this fishery, and I did not want to blast someone with a 6 ounce weight! So go ahead, , cast for me! It is safer that way! I did eventually learn his way of baiting up, and some other handy tricks. I learned the meaning of a freight train bite! We really didn't have any quite that strong, but once or twice it nearly pulled the rod out of the holder. A client of was out fishing for Chinook one day, and while everyone else nearby was fishing the same way, same location, same method, and not producing, boat was pulling them in regularly. A neighboring fishermen yelled at him, "Hey, what are you doing differently?" client yelled back, "There is a God, and I am fishing with him!" The lakes are picking up on the North Coast.. Guess some of the boats are now picking up the steelies planted earlier in the year. The trout at Sunset lake are getting bigger, eleven to thirteen inches, but still skinny! Things are picking up for Springers in the Clackamas also. I am bass hungry. I remember pulling in a bass this time of year that was 6 lbs out of Smith lake, and how much fun it was. Everyone else was fishing with these expensive lures, and I had a bobber and worm, yeah, that's right, bubba, a bobber and worm... and look out! Fish after fish! I know, it's not cool to fish with live bait, but I sure had a good time! I don't have access to that lake like I used to when I lived there, but perhaps some kind soul will remember me there, and let me in. I may go out to Coffenbury in the morning, today is pretty well booked, but a friend of mine, Ester, limited out in a half hour the other day on trout. Sounds like my kind of fishing. I just wish they were bigger! Oh well, I can pretend and use my micro reel and rod. You can nearly bend it in half! Actually, I think I may also bring my fly rod and do some practicing, so no one get near me or you'll get hooked! Hey, The Discussion board is getting very interesting, keep up the good posts! I really enjoy listening to all of the reports, and hearing little tricks of the trade. Mostly I enjoy watching people share information, and become more knowledgeable about a new fishery. I was thinking again, and marveling at the wonder of the Internet and the information we can absorb. Actually, I have trouble absorbing it all! I just think it is incredible all of the wonderful people I have met through this endeavor, and of the happiness it has brought me. They say do what you love, and it will pay you back. Well it has. Not monetarily, (believe me there!) but in the smiles and the people I have met that share this love of the outdoors and fishing. Fish with any steelhead rod, casting or spinning that will handle a two ounce weight.Use multiple hooks, size 4 or so, on a short dropper off of your mainline. Sometimes the fish are feeding right in the surf, so you don't have to get way out there. Work the shoreline watching for crab holes. Sandshrimp works well, as do clam necks, but since we are forgetting what Razor clams are here in the Pac Northwest, sandshrimp are your best bet. I actually have some clam necks in my freezer though! Along with alot of other assorted fishing and crabbing bait! fish a day. These Springers are in great shape, weighing 8 to 18 pounds. bouncing. The water levels have been changing with the weather. hold in the traditional holding spots very well. I'll be in Astoria fishing for Sturgeon around the 22 of May." Let me see if I can offer a little insight into what Mother's would really appreciate on Mother's Day. An eight foot all around G loomis rod would be nice, for salmon. A freezer full of good salmon roe all stacked up and ready to go, so that every time I opened my freezer or fridge it wouldn't remind me of having to cook for dinner, but would instead fill my mind with visions of rivers full of fish. A new tackle box... I know I have 6 but I can always use one more. Go ahead, plant little flowers in it to make it look pretty! I'll replant them in my garden and go to work sorting weights and hooks appropriately. Oh, I know, not all Mother's would like these things, but I think you may be surprised by how many of us there are! Soaking in a hot bath last night, reading the latest "Salmon Trout and Steelhead" magazine, I got to thinking about fishing with men that are experts. I love to fish with guides, and people in the know. It is not only men I am speaking of, but anyone I fish with that is better than me. Being not an expert, I just love to fish. Even though I love these guided trips, what fulfills another need is fishing alone. I feel handicapped when fishing with these people, and rightly so. These guys/women/guides, whatever, know what they are doing! However, I am not free to be my own scientist. I fish the way they say to fish, and am a little frightened to do it wrong, and be counseled, yet again, as to why I shouldn't do it "that way". But I do listen, and gather information like a hawk, and I am obedient, and fish like a good girl, exactly as they say. When I am alone though, look out! I take all of the information they share, and really get into it. Free to try this, and try that, and look up and down the river and study it, see fish where I think fish will be, think like a fish, and get lost in thought as to what will work and what might not. I take all of my hypothesis, and all of my facts and jumble them up and no one will tell me, "NO, that won't work!" In fact, some of my best memories are fishing next to people at a new place, and they laugh at my new tactics. There is nothing more fulfilling then catching my limit and leaving them shaking their heads as they sit there fishless! Now, this doesn't happen very often, but when it does it is the most wonderful Mother's Day in the world! Fishing alone is not always fruitful. I catch more fish when I am with a guide, but it feels kind of like cheating! The solitude on the river does more for me than a fish, and I feel better when I catch a fish all by my self with my own tactics! I will never give up fishing with guides, because I learn so much and it is a totally different animal. (so to speak!) Not only are guides extremely entertaining, (and I spend the day laughing and catching fish!!!) but I have stored vast amounts of knowledge from these folks who know their waters inside and out. There are some times when I NEED to catch a fish. This is when I want to fish with a guide, because believe me, I don't catch a lot of fish on my own! I am fishing always. I am fishing when I write about fishing. Why do you think I do it? I write about fishing mostly in the morning so that I can clear my head to get on with my day. I am fishing when I am preparing dinner. Meat loaf sometimes comes out of the oven in the shape of a fish! I fish in my dreams, I fish when I am in the car telling my sons fishing stories. I am fishing when I am driving alone, and I pass a body of water. When my Dad tried to convert me to golf, all I could do is study the water hazards...I am fishing when I compose music, and embarrassingly, I may be fishing while I am trying to carry on a conversation! I honestly don't have all the time to actually fish that some might think I do. I am pretty busy with kids, and life, and work... But in my mind I have all the time I need to be out there... So next time you are talking with me, and I look distracted, I am on the river...I am thinking up a new method, I am drifting down the river to the next hole, the water is cool and green and my plug is working the tailout.... and if I smile....I have seen a silver monster flash through my mind! Happy Mother's Day to all of you fish women out there, and to all of the males in the species, thank you for sharing your knowledge and a place in the boat with you! Hmm I hear kids in the kitchen... Wonder what I will get for breakfast? This weatheris so bizarre. With all of the snow pack and the cold temperatures I was thinking about spring/early summer flooding. If we get a week of warm temperatures it could be really bad for the Columbia. Coffenbury lake trout are being hauled in by anglers with daily limits. If you want yours, go now! It is a great time to take kids, or try out new methods and still be successful. People are mainly using rainbow power bait. I was going to try flies, but there is no hatch! The Clackamas is pretty cold and I have heard of some guides actually canceling trips. Water temp in most lakes is still way below 60 and thus bass fishing is off. I had heard the Shad were in, but a friend of mine said he went out there and didn't even think of trying to fish for them because of the cold water temp. He caught a small mouth bass though! I was so thrilled to talk to Stan Fagerstrom last night on the phone. He is an author of some very hard to find fishing books, and a fine poet. He is also a master caster and you have probably seen him at outdoor sports shows. He is also a musician! I love it! He wrote one poem that particularly touched me and he gave me permission to display it here. Is it almost steelhead season yet? Is it almost Thanksgiving? It FEELS like it! The sky LOOKS like it! I'm DRESSED like it!But no! It is... Spring? Prove it! I just got back from Coffenbury lake. I was there a total of an hour. Caught my limit of squirming little wimp fish trout-lets in about a half hour.Released as many as I could waiting for the illusive "big" one, and I think I caught it. He was a whopping 13 inches! Impressed?! I did use my little micro though, and did get a giggle now and then. I can't wait till they put the vitamin fed trout in. Super Trout!!!! I tell you, it's the place to be with small kids. They would really giggle! I fished with the usual power bait, rainbow to be exact. It was beautiful out there, I must admit. Not a soul in sight but the birds and squirrels. The cormorants were working the lake furiously. I fished for sturgeon out on the port docks of Astoria Monday, and didn't do any good, but I had a wonderful relaxing day. Cooking stew and homemade bread just like steelhead season... but no, Jennie, there are no steelhead in these rivers now. How many days till Steelhead?!? Nice quote sent in from Gerhard Grieser, a local fishermen. "Fishing rewards hope more often than most things we do in this life.Even if you never get a bite, you get back in touch with the sea, and once you've done that, getting in touch with one's soul is not far behind"
Thanks Gerhard! I needed that! My shoulders are so stiff from playing difficult passages of music.Too bad it is not from playing a big sturgeon. I Played with a really hot opera singer from New York and had a great time. There is nothing quite like playing music with someone, and you breathe together and think together and it just works! Sometimes I miss performing with people like this, but the stress it causes is quite intense, even if the outcome is great! It's quite exhausting however, and my days on the road are over. I'm much happier now that I have more time to fish! Speaking of fishing...I want to go! Is there anything happening? I feel the need to be in a boat somewhere! All you can do is dream. The rain is pouring down and you think that you might just go crazy if it doesn't stop. You know, I love the Oregon rain. I do! This is just so extreme! So I decided to just dream. Plan all kinds of warm weather activities. Book a trip with one of the guides and know that by the time your trip comes around it will be sunny and you'll be wearing less clothing and sporting a healthy glow! Herbal Essence, but whatever works! The weather does affect me. I did however, get to sneak out after church yesterday and fished off the dock at Coffenbury, in heels and a dress for a short time with a girlfriend. It was so crowded, and I felt a little awkward, but did get to feel a fish, so I got what I was after. I sure want to fish for bass. I think I will escape tomorrow and go down to the lakes and just see if it is still too cold. Next week the Clackamas or the Sandy. Can I make it on small lake fish until then? Only time will tell. All I need is a little sunshine and I will be fine. Maybe I'll hook into a nice spring bass! I am going on a fish hunt after a biz meeting at 10. I have my car packed with sturgeon gear, bass gear and trout gear. I also have it packed for a secret hunch I have that I am not going to reveal because you may laugh. What I am hoping for is that I will return laughing! O.K, I will give you a hint or two.. I am trying to find a place to catch Springers from shore. It may not work, but I like to try. I have been dreaming of the "what if" they are there and no one knows it. Wouldn't that be a blast? Anyway, I am set for everything, and I just have to succeed today! Well, with all of the fishing gear I took yesterday, you have to say that I really tried. But I didn't come home with anything more than 12 inches long. The little trout in Coffenbury have little tiny eggs in them! They are also filled with bugs, so fly guys, get out there! When I went to my secret hope spot, the tide was so low that there was no water in there! Plus, the gillnetters had it plugged out. The fact that they net right there in front of the tidal overflow makes me hopeful though! Why would they net there if there were no fish? They net there in the fall when I catch jacks, and when they are present, I catch nothing! But the minute they pull there nets up, zip zip zip goes my bobber, and I'm in luck! I would love to go out in a gill net boat sometime. Believe me, there have been times when I disliked gill netters so much! I remember once fishing on the beach, and they were supposed to drop there floats no closer than, oh, I forget, 50 feet offshore or something. But I was fishing, and the guy came up on shore, flipped his floats out, right on the beach! The tide pulled at his rig, and washed my whole rig down with his net! 8 ounce weight, full rig! OH! I was so mad! I felt like rerigging and casting out into his boat! (And I could have, he was so close!) But I have come to a balance, I suppose, knowing that they support their families this way, and there are good gillnetters and bad. I would just like to see what REALLY goes on. How many sturgeon do they incidentally catch, for real, and what is actually reported. I know, I shouldn't doubt. Anyway, yesterday I threw around some bass gear with no luck, but I don't claim to be a great bass fisher, just a hopeful one, so my lack of luck is no indication of the potential. I visited the nice gentlemen at Sunset, sipping coffee and pulling in a trout or two. They are bigger in Sunset. My girlfriend stayed after I took home my limit at Coffenbury, and caught a couple really nice bigger trout. The weather is turning warmer this week! I need this! Two things to watch for, though, Bass fishing on the upside, and lower Columbia flooding on the down. We'll wait and see how this plays out. Got a neat letter/report from a lady angler on trout fishing. These are the results I am after here at ifish. I love to see that people are finding new fishing spots, and enjoying life the way it should be enjoyed! On the water! I posted a page on my fishing trip with . Sure had a blast! The pictures did not turn out so great though.. I need a good digital camera! Anyway, I hope Don Larson of the Sturgeon page doesn't have my hide for posting the feasting picture of his. hee hee.. I'll take the risk. If I click my heels three times and say "There's no place like Tillamook Bay" three times, will I be transported? I must have a feather in my cap. I love this fishing page, and all that it brings. Lots of letters from fishing folks, lots of information, and when I can't physically be fishing, I can think FISH! My life is great, the sun is shining, the fish are coming in, and I am in a circle of friends who all LOVE fishing! Sunset Lake, for those who have asked, is in between Seaside and Warrenton past the Astoria Golf and Country Club. The Clackamas is in and out. I have heard good reports and bad, and I will fish it myself the beginning of next week. Sturgeon is picking up on the Lower Columbia. Tiki brought in 2 nice keepers yesterday, and I have heard lots of similar reports, that YES, the fishing is getting better all the time. Now let's just hope against huge spring run offs. The sun is shining, did I tell you that? Well, have a great day. It's FRIDAY! Now to me, that means playing the piano all weekend, but to most of you, fishing for the weekend! I'll be out the first of the week, save the sun for me! There is this weird, yellow, fiery looking ball in the sky. Anyone else no what this is? It's oddly warm outside also. I need a Clackamas report! I need a report for this river that will absolutely guarantee that I fight a fish! Actually, what I really need is to stare into the water and not think about anything but fish. This is more likely, and I don't want to set myself up for failure. If I catch a fish, it will be a bonus! I'm waiting on the Trask fish. What is taking them so long? Don't they know it is time now? A friend of mine caught a couple Salmon out in the ocean. Another did well out there for halibut, so things are picking up. Jim Erickson fished T bay for sturgeon and got skunked. Am I suppose to report this, Jim? Woops, too late. O.k., baseball game at noon, and a piano gig tonight with a little sun time in between. I can handle this while all of you are out there fishing, really I can! Then I'll get up tomorrow and play a little more piano for some nice folks, and then teach, and then WALLAH! I'll be a free fisher woman too! WOW! What a morning! Off to church! Wherever you do you're thanking, whether it is on the river, on the lake, or wherever, say Thanks for this weather! We need it! There is no place more beautiful than on the North Coast when it is sunny! Oh, now I remember..... I don't like extreme heat! It occurs to me why I like the rain. It is comfortable! The sun is beautiful though, and on my way across Youngs Bay Bridge this morning, I saw little white bobbing boats just packed into a hole fishing!It was just crammed with them! It made me happy. A nice unique fishing village picture on an unusually warm day. Then I came home and laid in the sun.... for about 5 minutes! Too hot! Then off to Cullaby Lake to dip the kids.. When it is hot at the coast, it is stifling! I still got burnt, and now I am sitting here in a hot, muggy house, with all of the fans going and skin glowing. We don't do air conditioning here at the coast, but sometimes I wonder why. I am off for a couple days to go on a fishing adventure! The kids are going to their Dad's. A friend is staying here to watch the dog. Everything is in place. I have one gig to play in the morning, and then FISH ON!!!! Things are just too busy here on Earth these days. Remember when we grew up and Mom cooked everything from scratch? She had time! Now days people buy a box and add hamburger and call it dinner. Guilty. have it or are doing it, then Gosh, we have to do it too! For kids there is hockey, softball, baseball, piano lessons, art lessons, acting classes, soccer... and I don't mean any of these things are bad, but they just get more and more elaborate, expensive and time consuming. Sports teams have us traveling and moteling it for the night. There are movies that you just have to see, and you have to be the first! And if it is more expensive, and time consuming it is better! The absolute reality of all this hit me as I was fighting traffic in Portland on the way home today. People do this everyday? Where is the quality of life? I did not get to fish on my time off. The rivers were out of shape and too high, and my fishing friend decided against it at the last minute. WAH! But I did go to Portland and stayed with my girlfriend. Then I went for long walks in two of Portland's prettiest parks, and I can tell you that it was just about as magical as my trip to Disneyland, without the expense of the trip or the stress of traveling. (Don't get me wrong, I LOVE Disneyland! but everything was intensely green!) The trees, the grass, the moss, Oh My! The water in the Willamette actually looked clean and you could see the bottom! The color of water always amazes me, and I can't help but study it to think where the fish will be. (It is a sickness, I think...) The sky was a soft pastel blue, and it was just perfect! I had to stop a couple times, and wonder how anyone could say there isn't a God! I had to stop and just take it all in, it seemed to be almost too stimulating! And this is nature! Ordinarily I think of things that are too stimulating, and what comes to mind is the business of the new world, the traffic, the sights and sounds of cities, movies, theme parks, Nintendo games, etc. I was absolutely awestruck by the colors today. We walk right by it, and don't really take it all in. We are desensitized, or at least I realized I was. This all brings me to my final thought, and what seemed like a revelation to me. I never could figure out why I liked to fish. I am a girl. Girls don't like to fish, do they? I always felt out of place, until I decided to embrace it and just go ahead and love it, live it, do it! Fishing is mostly slow. I need that! You can't organize a tackle box in a hurry... ouch! You can't care for a rod and reel properly without TLC and time. I think of the nights I sit down with a fishing project at hand, whether it be tying leaders or cleaning a reel seat. Calming, soothing, comforting. Plunking is the ultimate in slowing down the world and I need a steady dose of this. Steelhead fishing on a drift is repetitious at times and the repetition of the motions I go through is what soothes away the other times when I have three phone calls to make, my son is home sick, I am late for a meeting and someone asks me to sight read Mozart for a performance in an hour. If I am very lucky, I will be rewarded for my patience and my heart rate will pick up as I feel the ever so slight change in the way my rod feels in my hand as it passes through a drift. It proves to me that I don't need Disney World to get my heart rate up. Just a fish. This is one of the many reasons I like to fish. What a hypocrite I am! I talked all day yesterday about bah humbug, busy, and how tranquil I would like life to be, and then I created a list of 101 things to complete by noon! I am doing this, of course, so that I will have time to fish! How do you win?! The Willamette is reopened to 2 fish per day, one of which can be an adult Chinook, and the other I guess a steelie. O.K, kids are home and I am still on the computer. Time to go and catch up with their lives. I will be fishing tomorrow morning at the Lakes, and Friday either T bay, The Wilson, the Trask or Columbia for Sturgeon, (haven't decided, have to wait and hear reports of my best chances!) Saturday I am taking the boys out on the boat at Coffenbury. Oh yeah, I added a page called SWIVELS, a page of links, or a way of "connecting lines" here on the internet. It is not nearly complete yet, just a starter. WOW! Len Self did really well on the Columbia today. 30 fish and five keepers! That sounds like a fun day to me! He said smelt seemed to be doing the trick today. Posted a pic here. O.K. I can talk about fishing, really I can..
O.K. Fishing... No! I can't do it! B L A Z E R S R O C K !!!!!! Wow, what a game! I really needed that. We all need that! Portland needs this! How exciting! But it is scary too.. Can I take the stress of the upcoming games? I get way too wound up! Anyway, yes, I am going sturgeon fishing in the morning. Sounds like things on the Columbia are heating up, that is if you can weather the wind. Life is good, the Blazers are doing great! Poor Malone. Poor Anderson. Poor Utah. No, really. It is sad. They worked really hard too. But Portland deserves this! What the heck is this a basketball column? I'm sorry. Back to fishing. Smelt seems to be top bait. However, for the price of smelt, you could probably buy yourself a mean fillet of sturgeon. Smoked even! I have to go back and watch the victory... The BLAZERS victory! The kids and I went outside and did the ritual of banging pots and honking the car horn. It was a blast! The neighbors didn't even REALIZE what was up! What's up with that???? Anyway, I'm happy, we won, I'm fishing in the morning.. What could be better? What a great day! Two sturgeon bagged the first hour we were out this morning. Fished the Columbia with Bill Hedlund, and thanks to Len Self, fishing nearby, I will have some great digital pics of the two fish we kept. One was 56", one 48". The weather was great, and we just had a great time. Caught a fair amount of shakers also. The bigger one was tagged. Len just got a new Olympus digital camera to take pics of all his clients catches, but we talked him into photographing our catch today. How fun! Funny thing about today, you know, alot of times you get so stressed out about going, and getting ready and out there by a certain time, but we just kind of meandered out there at our own convenience. I had to take my son to the Orthodontist this morning, and when all that was taken care of, we sort of just put in and went! Lucky us to hit it just right! I fished using smelt that I had used a month ago and refroze! Bill fished with shrimp. I seemed to get more take downs, but by the time I picked up the rod they often were gone. Back here by about 2, and now I can get some work done, with the contentment only a limit of fish and great company can bring! Went out to Coffenbury Lake yesterday with Bill Hedlund and my kids and caught our limit of trout in about and hour and a half. That's twenty trout to clean! It was a breeze though, and the kids had a great lunch. Met some people at the campground that read IFISH. (Hi Ray and gang!) We gave them some trout and wished them a happy camp. I got my pics from Len, and I posted them here on Jennie's Fishing pics page. Today is my piano student's recital, so after church, I have to quick make some cookies, print the programs and go set up! I can't wait, they have worked so hard and sound so good! Even my Dad is driving down from Canby! Oh, the trout, we caught them on Bobbers and worms in the middle of the lake in front of the second swimming area. Fished about 3 feet down. My kids outfished me, and so did Bill! Oh well, chalk up a good fishing experience for the kids, and that is more valuable to me than anything else! See, that's money in the bank, I DO want to grow my own fishing partners!